Yippee I made it back. Isn't it funny sometimes how you can colour an image and then get totally stuck! Well that doesn't happen to me sometimes ... it happens to me all the time ... sigh. But tonight I didn't struggle as much. I found some colours that I loved and did a simple layout ... and was so happy with the result! I think this is one of my favourite cards so far ... yes its simple, not many embellishments and not a lot of patterns but I love them like that. I used a chipboard 'buckle' and coloured it with my copic V17 ... I had never done that before and am so excited by the result that I will be doing it again very soon. The other colours I used are:- BG01, BG05, BG07, BG09 V12, V15, V17 E000, E00, E02 and E33, E35, E37 and of course spica pens! But unfortunately the sparkle does not show on the photos. I love this Tickled Pink stamp called Lil Allsorts Kira. I have so many Tickled Pink stamps and I did want to use one of my newer ones .... but I keep getting drawn back to her. I love the look on her face ... it can say so much. Simple, clean straight lines ... but I think it really worked. 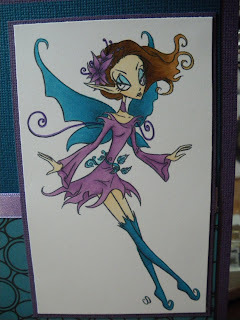 How excited was I .... to use a chipboard piece and colour it with copics! First time for me ... love it! Colours don't look that great here as I had to use the flash. So happy with my colouring .. didn't go outside the lines (much). You may notice on this image here that her eyes are not coloured ... I only just noticed so I have now added some colour ... (you will see it in the image above) silly me. Tickled Pink is also doing a Design Team Guest spot call! I'm so excited ... and am applying so fingers crossed and wish me luck because I'm going to need it (there is way to much great talent out there, but I've got to try). 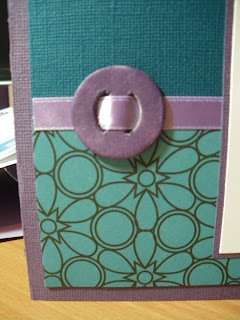 Gorgeous card Carly, I like the image and the colour combo. Beautifully CAS! UUHhhhhh.........I am so getting this image if it's the last thing I do. Nice touch of chipboard! Thanks for playing with us at TPS this week. Good luck with the GDT . Lovely card Carly, love your bold colours. 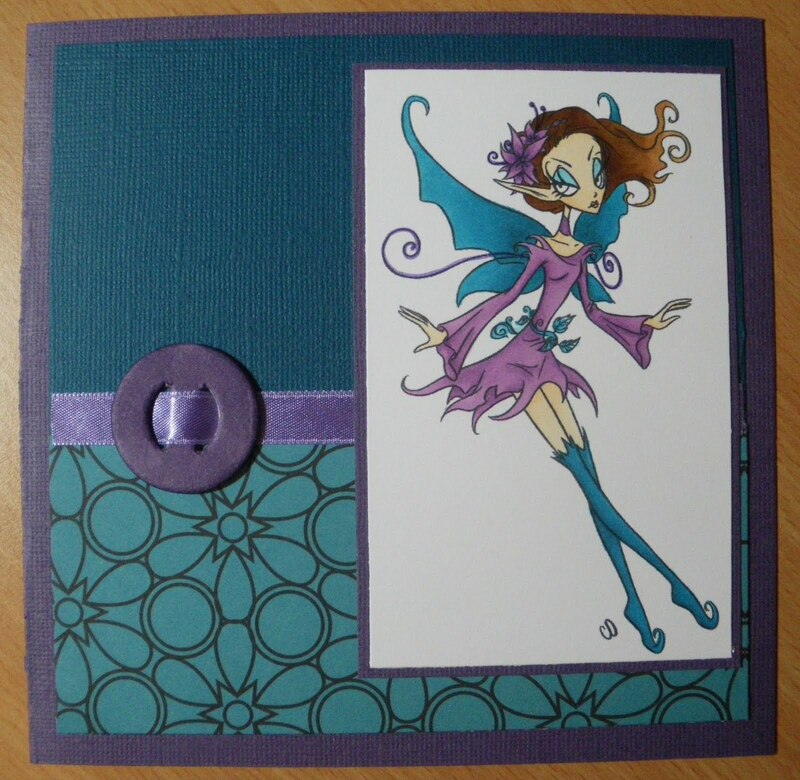 I love the colours you have used in this card - purple and blue go so well together. good luck for the guest DT posn! Omygosh Carly! I can't wait for you to stop coloring as I read in your post after this one. 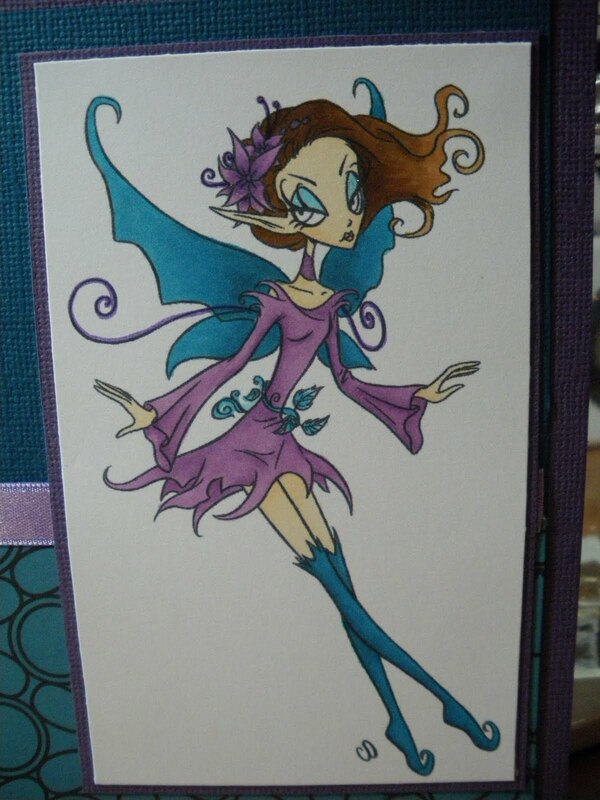 Your coloring is fabulous and this card is a real treasure. Less is more, I can see all the beautiful colors, and slider and purple...wow!